My capsule wardrobe outfit of the day featuring using neutrals beige and black for Fashion Over 50. Since making the change to a capsule wardrobe, getting dressed is so easy! Now, I admit there is nothing overly special about today’s outfit, but what is special is how easy it was to put together. 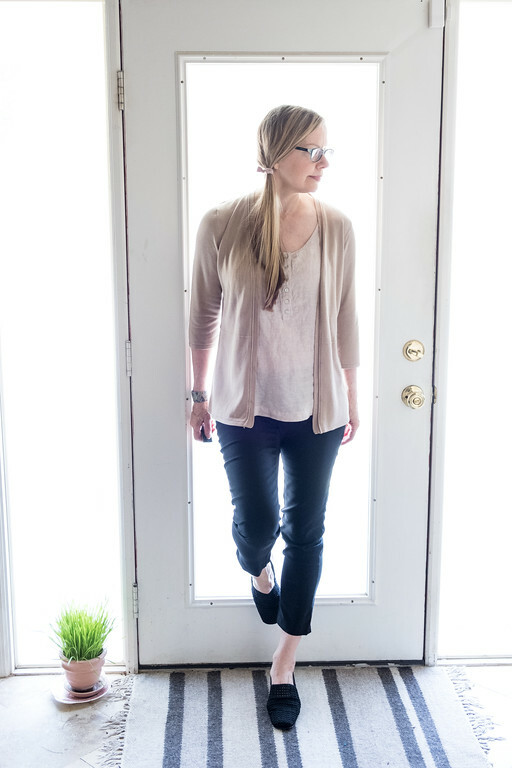 Before starting a capsule wardrobe, I would never put something so simple and easy together. I was always trying to wear a signature piece, and spent a lot of money buying nothing but signature pieces. Mixing two neutrals like beige and black creates a look that is simple and classic. I admit that I had to buy all three items of clothing specifically for this capsule wardrobe. However, they are all classic pieces that work with everything else. I found both the Jules & Leopold black skinnies and the Premise beige cardigan at Steinmart. I found the Jones of New York linen top at Marshall’s. 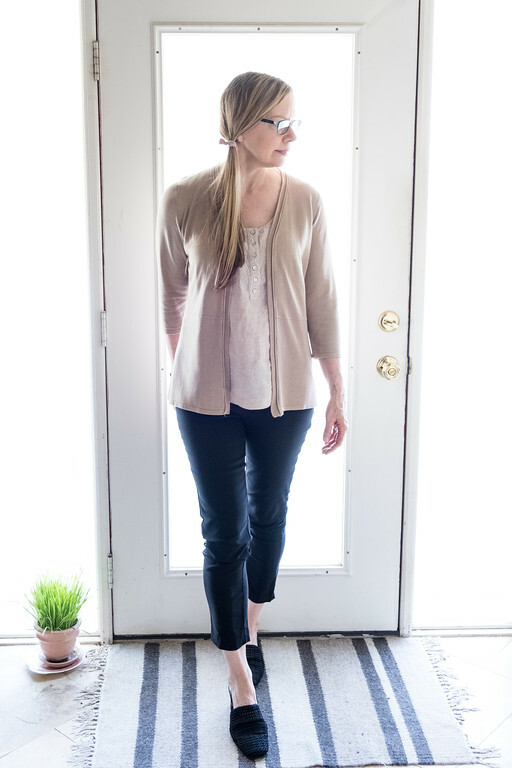 You can shop a similar look: Alfani Tummy Control Skinny, Ming Wang Pull On Ankle Pants, Ruffle Cardigan, Eileen Fisher Simple Cardigan, Nordstrom’s Linen and Silk Shell, and Frayed Edge Tweed Shell. Click here to see more of my capsule wardrobe posts! Looking so nice! I love the idea and I love this mix! I love the neutrals! Such a classic look! I have to say I adore a neutrals look and yes it does always look chic. I’m sure you will get lots of wear from those pieces. Thanks for joining the Top of the World Style linkup party. I totally agree that beige is a much better neutral than black for women over 50 and especially for blonde women. I absolutely love this classic combo! Love the hair do, you look great! Sometimes neutral looks can be the most eye-catching. This looks chic and comfortable for a day getting things done. Thanks for linking up with Thursday Moda!